AZFJ › Forums › Arizona FJ Discussion › General Discussion › Introduce Yourself Here!!! 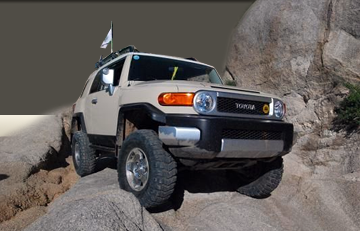 Forums › Arizona FJ Discussion › General Discussion › Introduce Yourself Here!!! Posted: Sun May 06, 2018 7:57 pm Post subject: Re: Introduce Yourself Here!!! Well, then, Watch the forums for a couple of upcoming significant Tucson area Runs that you'll want to be part of. I know that I'm needing more photos out on the Solero Rd/Bull Springs trail, and have to go through Chimney Rock. Sooner than later. Posted: Wed Jun 06, 2018 12:19 pm Post subject: Re: Introduce Yourself Here!!! I have acquired a new toy and am in need of riding partners! If anyone in the Tucson area wants to get out (hopefully in the cool..maybe mt. lemmon?) give me a shout! Posted: Wed Jun 06, 2018 2:53 pm Post subject: Re: Introduce Yourself Here!!! We're going on a pre-border scout mission on the 16th if you are up for it. Posted: Thu Jun 21, 2018 10:38 am Post subject: Re: Introduce Yourself Here!!! Hi, this is my very first post on this site. I go by the handle of LandCruiserSteve, I'm up here in Prescott Valley and I jockey an '07 Sun Fusion. Looking forward to hitting the trails and swapping ideas with fellow AZ FJ'ers!! Posted: Thu Jun 21, 2018 11:40 am Post subject: Re: Introduce Yourself Here!!! Posted: Thu Jun 21, 2018 9:44 pm Post subject: Re: Introduce Yourself Here!!! Wow. A blast from the past! Posted: Thu Jun 21, 2018 10:07 pm Post subject: Re: Introduce Yourself Here!!! Posted: Fri Jun 22, 2018 8:00 am Post subject: Re: Introduce Yourself Here!!! Hey Doc, great to see you, too!! Posted: Fri Jun 22, 2018 8:03 am Post subject: Re: Introduce Yourself Here!!! Hey, I've been lost my entire life. Posted: Fri Jun 22, 2018 8:04 am Post subject: Re: Introduce Yourself Here!!! Posted: Tue Jul 31, 2018 10:27 am Post subject: Re: Introduce Yourself Here!!! I'm Keith from Chandler - just picked up my 2010 last weekend and looking forward to some tweaks to it and getting out there. Posted: Tue Jul 31, 2018 10:54 am Post subject: Re: Introduce Yourself Here!!! Posted: Tue Jul 31, 2018 12:05 pm Post subject: Re: Introduce Yourself Here!!! Posted: Tue Jul 31, 2018 4:30 pm Post subject: Re: Introduce Yourself Here!!! Posted: Tue Jul 31, 2018 6:22 pm Post subject: Re: Introduce Yourself Here!! !